Superb build quality and excellent attention to detail are factors that strike you from the moment that you first hold the guitar in your hands. One of the most handsome-looking guitars that we’ve seen in a while, the Classic is essentially a simple guitar with strong traditional construction and classic (excuse the pun) lines that clearly indicates Martyn ‘s lifelong passion for Gibson guitars. A mirror smooth nitro-cellulose finish, mahogany body and slim mahogany set-neck looks and feels very seductive, and a series of internal tone chambers helps to reduce the weight of the mahogany body while increasing its resonance. The guitar feels exceptionally good to play; the neck has a rounded profile that feels good to hang onto while avoiding the heavy bulk of the standard Gibson ’59 neck, and the ebony fingerboard has a typically hard yet slippery feel, topped off by 22 beautifully finished Dunlop 6100 frets. 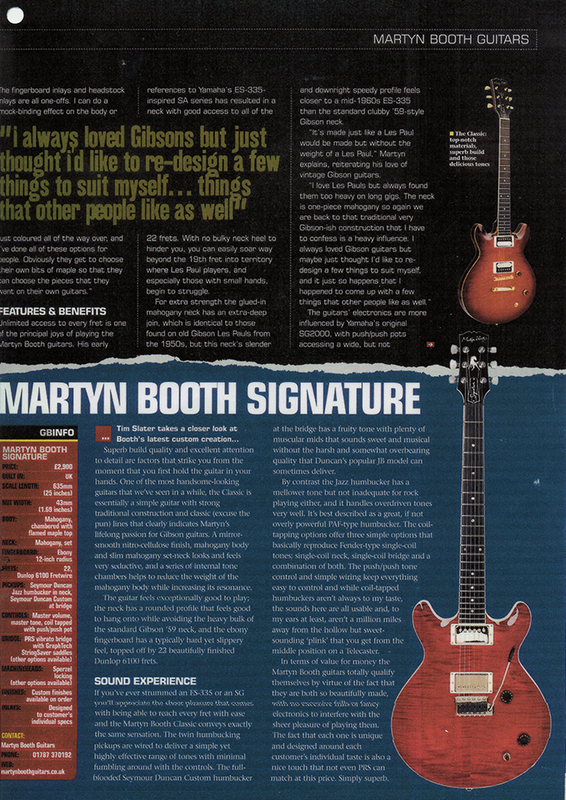 If you’ve, ever strummed an ES335 or an SG you’ll appreciate the sheer pleasure that comes with being with being able to reach every fret with ease and the Martyn Booth Classic conveys exactly the same sensation. The twin humbucking pickups are wired to deliver a simple yet highly effective range of tones with minimal fumbling around with the controls. The full-blooded Seymour Duncan Custom humbucker at the bridge has a fruity tone with plenty of muscular mids that sounds sweet and musical without the harsh and somewhat overbearing quality that Duncan’s popular JB model can sometimes deliver. By contrast the Jazz humbucker has a mellower tone but not inadequate for rock playing either, and it handles overdriven tones very well. It’s best described as a great, if not overly powerful PAF-type humbucker. The coil-tapping options offer three simple options that basically reproduce Fender-type single-coil tones; single-coil neck, single-coil bridge and a combination of both. The push/push tone control and simple wiring keep everything easy to control and while coil-tapped humbuckers aren’t always to my taste, the sounds here are all usable and, to my ears at least, aren’t a million miles away from the hollow but sweet-sounding ‘plink’ that you get from the middle position on a Telecaster. In terms of value for money the Martyn Booth guitars totally qualify themselves by virtue of the fact that they are both so beautifully made, with no excessive frills or fancy electronics to interfere with the sheer pleasure of playing them. The fact that each one is unique and designed around each customer’s individual taste is also a nice touch that not even PRS can match at this price. Simply superb.